Ladies half lined, flat front style trousers featuring button and zip fastening with side seam pockets and belt loops. Side back waist elastication ensures a comfortable fit. 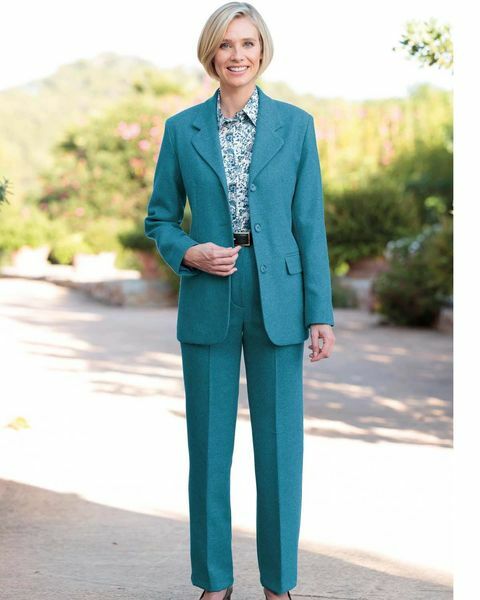 Fully lined, three button style jacket with gently shaped lapels and darts. Single breasted with front jetted and flap pockets. Medium weight pure shetland wool in teal tweed. Woven for us in the UK. Skirt Available in 2 lengths 28", 30"
Jacket Back Length Approx. 28"